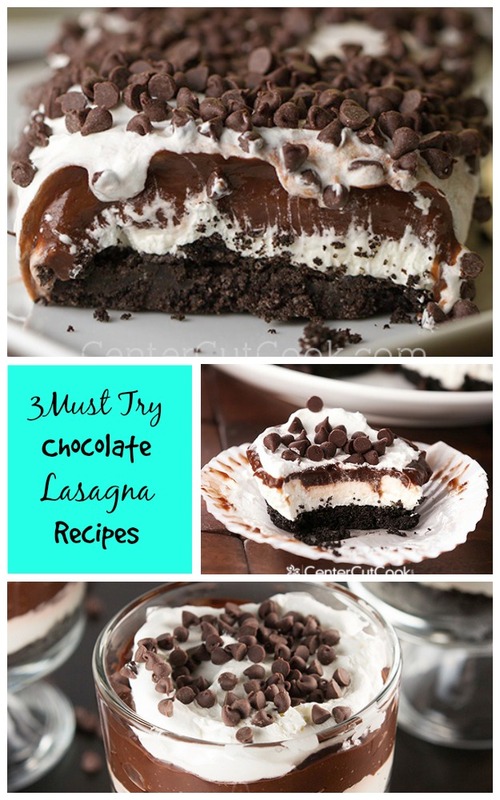 Three Ways to Enjoy Chocolate Lasagna! You’ve seen Chocolate Lasagna all over Facebook and Pinterest, now try the three best ways to enjoy it including traditional chocolate lasagna, chocolate lasagna cupcakes and chocolate lasagna parfaits! It was a little over a year ago when I first made and photographed Chocolate Lasagna and shared it here at CenterCutCook. It took only a day or two before my Chocolate Lasagna recipe and photograph was ALL OVER Facebook and Pinterest! The recipe went viral and the rest is history! While thousands upon thousands of people have viewed and made the recipe for the original Chocolate Lasagna that I posted, did you know that there are two other ways to get your Chocolate Lasagna fix? Both Chocolate Lasagna Cupcakes and Chocolate Lasagna Parfaits are quickly becoming favorites among Chocolate Lasagna lovers! Below you’ll find the recipes for three fabulous ways to enjoy the ever-so-popular Chocolate Lasagna. Chocolate Lasagna Cupcakes – Chocolate lovers unite! These Chocolate Lasagna Cupcakes offer layer upon layer of yumminess, and can easily be turned into the perfect frozen summer treat! Chocolate Lasagna Parfait – Chocolate Lasagna and Chocolate Lasagna Cupcakes are my two most popular recipes which is why I decided I’d give all of you chocolate lovers another way to enjoy Chocolate Lasagna! These no-bake Chocolate Lasagna Parfaits are a delicious chocolatey treat that you are going to love!